Lexington Furniture has defined high quality for decades. They are among the older furniture brands on the market, and regraded by many as the best. taking a look through their extensive catalog will likely ruin many other brands for you. Few furniture manufacturers ever reach the level of prestige and noteworthy market presence as seen by Lexington Furniture. In the furniture world there are many successful manufacturers, but there are only a handful of trendsetting furniture brands—Lexington Furniture is one the latter. Their extensive product line is an impressive survey across nearly every style and finish seen in current furniture trends, and their ability to craft high quality products further extends their grasp on the market. Lexington Furniture can be found in many local furniture stores, and is also available through many online retailers for considerably reduced pricing. Lexington Furniture is a brand which is difficult to encapsulate into words, marked by a deep heritage in America’s furniture culture. Their story of becoming a market leader by utilizing the abundant natural resources and skilled labor found in North Carolina at the dawn of the 19th century is tantalizing—only overshadowed by the fact their largest manufacturing facility still sits in it’s original location in Lexington, North Carolina. Lexington Furniture got it’s start as the Dixie Furniture Company in the early 1900’s as a group of local businessmen realized the opportunity of North Carolina’s natural wooded resources. Lexington Furniture pioneered what many would consider to be ‘Lifestyle’ furniture collections, and at one point they had the world’s most-popular furniture collection. Today, Lexington Furniture is owned by Lexington Home Brands, which is a collection of other notable furniture brands such as Tommy Bahama and Sligh Furniture. This larger corporate ownership allows the strategic sharing of manufacturing and material-sourcing resources that have no doubt helped Lexington Furniture to continue being the market leader in furniture they’ve been known to be historically. Lexington Furniture certainly has deeply historic roots—having helped pioneer American furniture throughout the last 100+ years. Their true character can be seen by how dynamically they are able to adapt to modern furniture markets and consumer styles. Their catalog today has amazing interpretations of everything from traditional bedroom collections, casual dining room furniture, sleek modernized metropolitan looks, and even elegant mid-century modern designs. Lexington Furniture offers designs for many different budgets and design goals, reaching from casual dining to elegant and luxurious. Take for example the Tower Place Collection by Lexington Furniture; this collection exudes a Penthouse-esque style of elegance associated with the ultra-luxe lifestyles of the roaring 20’s. This collection cathedral walnut veneers and lustrous brushed gold hardware make it resonate a sense of luxury and elegance within any room it is found. By contrast, the Oyster Bay Collection by Lexington Furniture presents itself as a transitional collection with subtle traditional elements masterfully finished in a soft neutral distressed Mahogany. To be able to present furniture styles so distinctively-different with such skilled excellence is the mark of a truly quality furniture brand. Lexington furniture isn’t a typical furniture brand, and they can hardly be compared to the majority of furniture manufacturers on the market today. Not only does their long-history within the industry make them more versatile and experienced in how they conceive their designs, but the ‘x-factor’ is the level at which their designs are crafted. All too often furniture is made through a series of concessions by designers to meet price points demanded by the market. A beautiful stone top insert will become beveled glass with no other reasoning than to lower cost; tufted leather headboards will become casual white linens; metal accents will be settled as simple contrasting paints. There’s a degree of this concession that has to be made by all manufacturers that make lots of furniture, but Lexington Furniture’s execution of style and high-class designs leads many to realize they hold their concessions to a minimum. Take, for example, the the MacArthur Park Collection by Lexington Furniture which features a deeply conceived tufted upholstered shelter bed with complimenting quartered walnut veneers on the case pieces. This collection has been designed from the ground up to resonate harmony within itself, and can completely transform any space that it is featured in. In addition to the magnificent MacArthur Park collection, Lexington Furniture seems to present as much detail on all their other collections as well. While these masterpieces won’t come cheap, Lexington Furniture is still priced within a range that is considered to be reasonable. You won’t find any $30,000 Beds in their collection. Another great collection is the Lexington Furniture Tower Place Dining Set, featuring the drake dining table and it’s softly-curved chairs. This collection showcases a beautiful radiating split cathedral veneer on it’s top, drawing in the focus of anyone near its presence. The matched-veneer dining chairs in this collection showcase a subtle linen on their amply upholstered seats and backrests, which are ever-so-slightly curved in their flared wing-back shapes. This collection is well-extended by Lexington Furniture with other such masterful pieces as a tiered server, a hidden-drawer buffet, and an elegant sideboard—all of which exude a deep sense of luxury such as only the roaring 20’s could conceive. Lexington Furniture has a wide array of products in their catalog, and the continue to impress not only buyers, but the rest of the furniture industry as well, with the constant execution of quality. While the price tag on most Lexington Furniture isn’t what you’d find in a Rooms to Go or Haverty’s in most cases, discounts available for those shopping online can dramatically reduce the price for Lexington Furniture. Lexington Furniture is revered as one of the best furniture brands in the entire world, and is therefore on the radar of most all furniture stores. Large furniture stores such as Furnitureland South will likely have a vast selection of Lexington Furniture, while local furniture stores with smaller markets likely will have sparse offerings of Lexington designs. To find a local dealer near you, visit the dealer locator app on the Lexington Home Brands website. Depending on where you live, you may be able to find affordable prices for the Lexington brand—and maybe even affordable delivery fees. If you want to buy Lexington Furniture for the cheapest possible price, your best option is to shop online through such retailers as Wayfair, Amazon, or other discount stores such as the family of discount furniture sites owned by the Emma Mason Furniture company. Amazon is trying to become a larger retailer of furniture, and some Lexington Furniture is available through their site, though consider that most are likely just listings from local dealers. Wayfair is the largest online retailer of furniture, and have a large selection of Lexington Furniture available on their website. They offer free shipping on nearly all orders, and have a tremendous customer support department. Be careful though, you might find 20 other things you want to buy while shopping there! Lexington Furniture is one of the most-trusted and high-quality furniture brands in the world, and their product line represents an innovative interpretation of nearly ever style known. 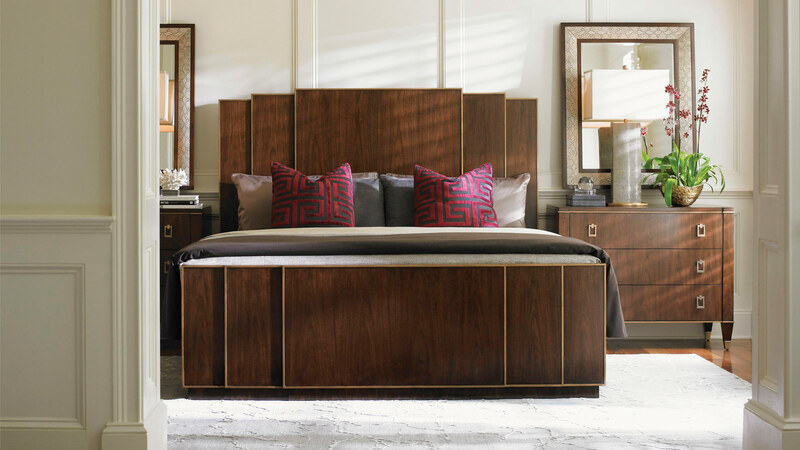 From their luxurious High Tower Collection to the soft upholstered edges of their MacArthur Park Bedroom Collection—Lexington Furniture pays attention to the smallest detail more than many brands focus on the large ones. Lexington Furniture is regarded as the pioneer of Lifestyle Collections which feature exhaustive numbers of different pieces for each different style in their catalog. This approach allows you to find a unique and functional option for nearly any situation or design goal, all while having the high-quality standards of the Lexington Brand. Lexington Furniture isn’t cheap by any standards, but by shopping online through retailers such as Emma Mason and Wayfair, you can be assured to find the lowest prices, and get free delivery in most situations. These sites also offer valuable customer service departments to help answer any questions you may have regarding the furniture you are buying, and are more than happy to help! Furniture can be one of the most powerful ways to enhance your everyday Home experience, and with the rise in online availability you can invest for less money than ever before. Overall, Lexington Furniture is one of the best brands you could consider to feature in your home or next design project, and few people ever stray from their brand once they’ve had their first taste of world-class quality and style. Lexington Furniture is among the best furniture brands in the world, and have an impressive catalog of designs fit for any style. Their rich textures and astute capture of fine details work to create a harmony of quality among their designs that will amplify the luxury of any space.